The legal, economic, archeological, political, social, architectural, demographic, institutional, and topographical aspects of the diverse phenomena called castello have formed one of the staples of the study and writing of Italian medieval and Renaissance history. The objective of this paper is to explain the political roles of the urban fortified properties held by magnate families or lineages within the domain of the commune of Siena during the thirteenth and early fourteenth centuries. Similar to rural castelli but without sovereign powers to tax or administer justice, these private environments in the city with their control of urban space served as centers of political, social, and economic power. 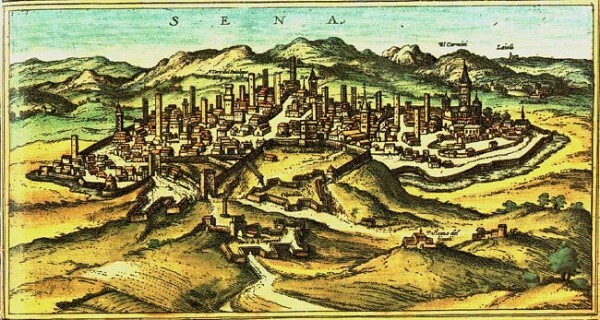 In an effort to establish, maintain, and extend its power, the commune of Siena had to deal with both the urban and rural properties of its richest and most powerful families. At the core of the enclaves were fortresses. Two examples of rural castles and their buildings are preserved in frescoes in the Palazzo Pubblico of Siena. Being obvious symbols of power and wealth, such castles, buildings, and surrounding neighborhoods offered alternative sources of protection and security to the citizens and subjects of the city. This entry was posted in Articles and tagged Italy, Urban Studies. Bookmark the permalink.